Enamel dysplasia literally means that the enamel, the outside layer of the tooth, did not form properly during development. 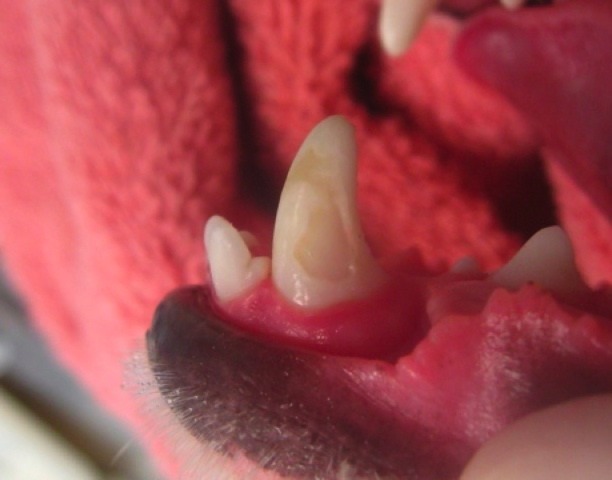 It is either caused by enamel hypoplasia or hypocalcification. It can occur either on a few teeth or can affect the whole mouth. Teeth will often display a rough surface, appear to have a chalky consistency, and may display dark colored mottling (below left). The enamel will often chip off with limited force (below right). Most common causes for enamel dysplasia include genetic causes, infectious/febrile episodes, drug/toxin exposure, nutritional deficiency, or early trauma. Enamel dysplasia is problematic because the hard outer protective layer of the tooth is compromised. This may lead to tooth sensitivity, increased wear to the teeth, or an increased risk of fracture. Depending on the severity of disease, the teeth may also have a lifetime predisposition to periodontal disease. This is primarily because the normal smooth anatomy of the teeth is rough, and thus allows for increased bacterial and plaque attachment. To determine the best treatment course, full radiographic assessment (x-rays) and detailed examination is advised. Depending on the extent and the number of teeth affected, treatment options may include dentinal sealant application, composite restoration, extractions, or prosthetic crown placement. Sealant and restorations are normally used in teeth where the enamel is roughened but the tooth, above and below the gumline, is otherwise healthy. Extractions are sometimes required when the structure of the tooth is compromised and susceptible to fracture or if disease is already present within or around the tooth. Finally, crown placement is sometimes used to protect the large, important teeth, like the canine and carnassial teeth, that may otherwise be damaged from normal use. Following treatment for enamel dysplasia, oral home care is very important in maintaining oral health. In addition, frequent professional cleanings, close observation, and recheck x-rays are also recommended.